You’ve spent a lot of time preparing a detailed project plan and you know it accurately represents everything you have to do. Then something happens and you have to change it. It feels like you’ve done all that work for nothing. You created the perfect plan and you’ve barely started the project before something comes along and messes it up. Here’s the truth: it happens to everyone. Project managers have to update their plans all the time. As Helmuth von Moltke the Elder said, “No plan survives contact with the enemy.” Embrace the need for change and update your plan today! Here’s how. 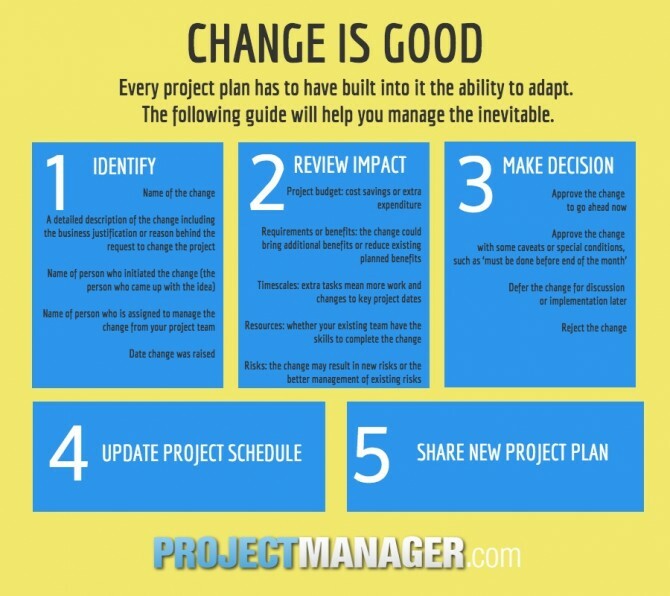 First, recognize that as soon as your project changes, your plan has to change to adapt to those new needs. It’s a good thing that you are amending your plan to reflect new requirements. And it’s easy to make changes because you’ve put in so much work already making sure that your plan is in great shape. Clearly identify the change that is under consideration. It might have originated from a team member, customer or your project sponsor. Make sure you fully understand what they would like to do. Many businesses use a short change request form to capture the details and why the change is required, but in reality requests for changes arrive at the door of the project manager in many formats. These could include email and discussions. You’re now on track to manage changes to requirements effectively. Just the practice of writing them down will help keep control of your project scope. It has a tangible business benefit: research by PMI reports that 5.1 cents of every dollar in your project budget is wasted due to poor requirements management. When projects are judged by being on time and under budget, that 5% can make or break your project’s chance of success. Only 33% of respondents to the same survey said that they performed well at managing change. There could also be other reasons to carry out the change such as a legal or regulatory requirement that means it has to happen. Taking all the information together, you can then assess the impact and priority of the change. First, consider the impact using a Low, Medium or High ranking. A change that is going to fundamentally change your project plan and require lots of new resources is going to be High. One that adds just a single day of work is going to be Low. Then consider the priority. How essential is this to the project? Think in terms of delivering business benefits and check back against your business case and Project Charter. Use the Low, Medium, High categorization to rank the change request in terms of priority. Something that your project sponsor has asked you to do for legal reasons is obviously High. Something that’s a nice to have would be Low, and could be recorded here so that you don’t forget that it’s a good idea. Pro Tip: This assessment is, by nature, subjective. Be prepared to facilitate discussions between stakeholders who have differing views. It’s not uncommon for the person who put forward the change to say it would be easy to do with low impact and high priority, but trust your experts! Keep your assessment as objective as you can so that you fully understand what’s involved and can effectively manage your stakeholder’s expectations. Whatever the outcome, you’ll need to let the person who raised the change know what is happening and why. You’ll also have to inform the project team so they know if they are supposed to plan for and do any additional tasks. Update your project management software to include the date that the work on the change is due to be completed by. This will help you monitor progress and check that changes are being worked on in a timely manner. Pro Tip: If it’s a small change you can ask your project sponsor to make a decision verbally or in an email – it won’t need a big discussion. For anything significant, make the decision during the project board or steering group meeting and document it in the meeting minutes. Add the new tasks to your project schedule, using the information from Step 3 to build out estimates. Allocate resources to that work and update any other documents so that your records are complete, especially your project budget. When the work is completed, mark the task as done on your project plan and go back to your change log to record the date that the change was resolved. Note down what was done so you have a record of the work and any other notes that could be useful to the team in the future. Jennifer Bridges, PMP, offers further help at managing change in this short training video. It outlines a clear process for controlling project change requests. Manage your plan like a pro by incorporating changes quickly, even if it does mean revising the schedule several times during a project. ProjectManager.com lets you shift tasks around on your schedule and add new work with a few clicks. As it’s all online it’s easy for everyone to see the latest version of your perfect plan, however often it changes. Try ProjectManager.com today for perfect online project planning.